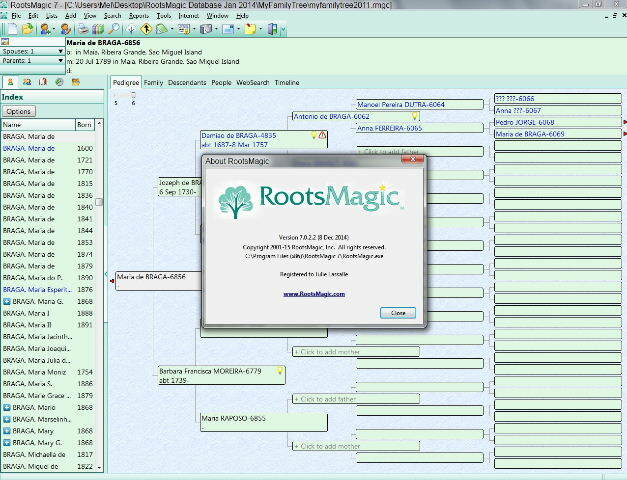 Yes, I got RootsMagic 7!!!! Woo hoo!!! I’m excited because I was still using RootsMagic 5. More importantly, I got RootsMagic 7 right after it was released. When I got RootsMagic 5, they upgraded to 6 two months later. Grrrr! So now, I get to have the brand spanking new version. Of course, I installed it Christmas night. Did you expect me to be able to wait until the next day? The look and feel is the same as the previous version. The big thing that I am thrilled about is the little warning symbol on entries. I have arthritis and although I type almost as fast as I did before arthritis I do not type as accurately. (Don’t tell me to slow down. The slower I type the worse it gets.) I can now easily see the inconsistencies in dates, missing gender, and so forth. This is a wonderful addition! I’m not all that thrilled with the light bulb MyHeritage suggestions. I don’t have a subscription to MyHeritage. But more importantly it has to do with my immigrant ancestors. I’ve mentioned before that I have what I call New Immigrants. What I mean by that is I have no roots in America prior to 1847 (that I know of at this time). The majority of my immigrant ancestors came between 1882 and 1907. Many of the databases at MyHeritage besides the census aren’t much use to me. The light bulb does link to show links to my WikiTree entries. There’s some comfort in that. There is still much to explore with RM7. I saw something called “web tags” that I need to figure out. I’m excited as all get up and have already done some input just to play around. I think I will watch some of their webinars to familiarize myself with the changes. They are free, so what the heck! Thank you Genea Santa! I am very happy with my gift. Great post! You can turn off the web hints, little light bulbs, by going to tools, file options and Web Hints. Uncheck what you don’t want. Santa smiled on me too! Sherri, thanks for your comment and the tip! I don’t think the Web Hints will be useful to me, so I may just turn them off.